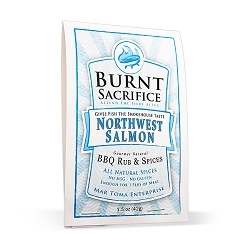 This rub turns your oven or grill into a smoker giving you all the moist benefits of the oven with the smokiness of the smoker. 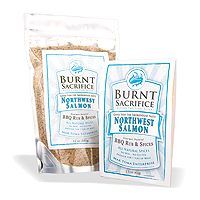 It was blended to bring out the richness of the salmon and give you that indescribable smoked salmon taste that is second to none. 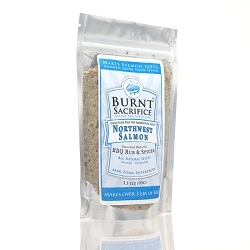 This is our most innovative rub. Best on: Salmon and dark meat fowl like chicken thighs and legs. 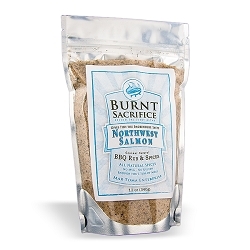 Ingredients: Brown Sugar, Salt, Mustard Seed, Black Pepper, Cumin, Dill, Spices, and Natural Hickory Smoke Extract. Copyright Burnt Sacrifice. All Rights Reserved. eCommerce Software by 3dcart.